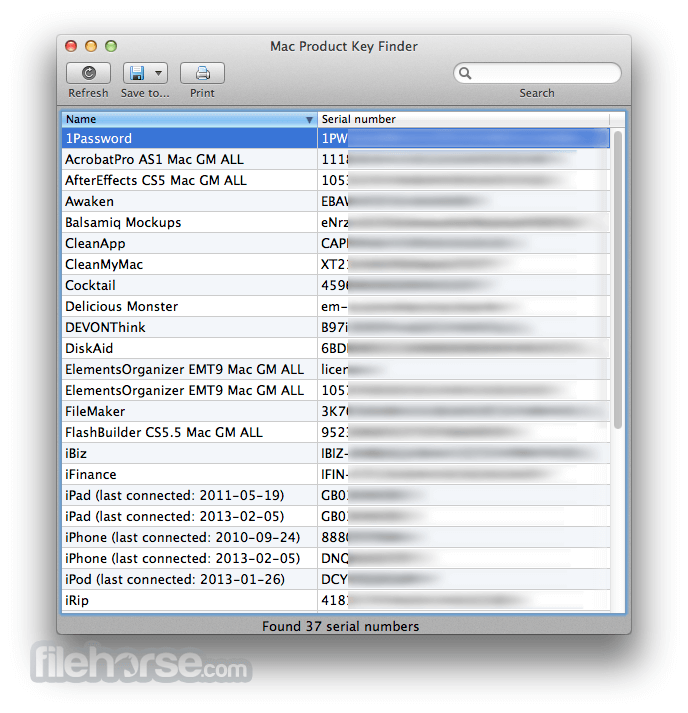 Mac Product Key Finder is freeware program for recovering lost product keys (or making backup before it is too late) for software installed on your Mac. This small tool will scan your Mac for installed applications and show your product keys (serial numbers). You can save this list to a file (HTML, XML, CSV, PDF and text file) or print it. Currently, list of supported software is not very big, but it includes popular software such as Microsoft Office 2008, Adobe Photoshop CS3-CS5, Parallel's Desktop, Panic applications, VMWare Fusion and many more. 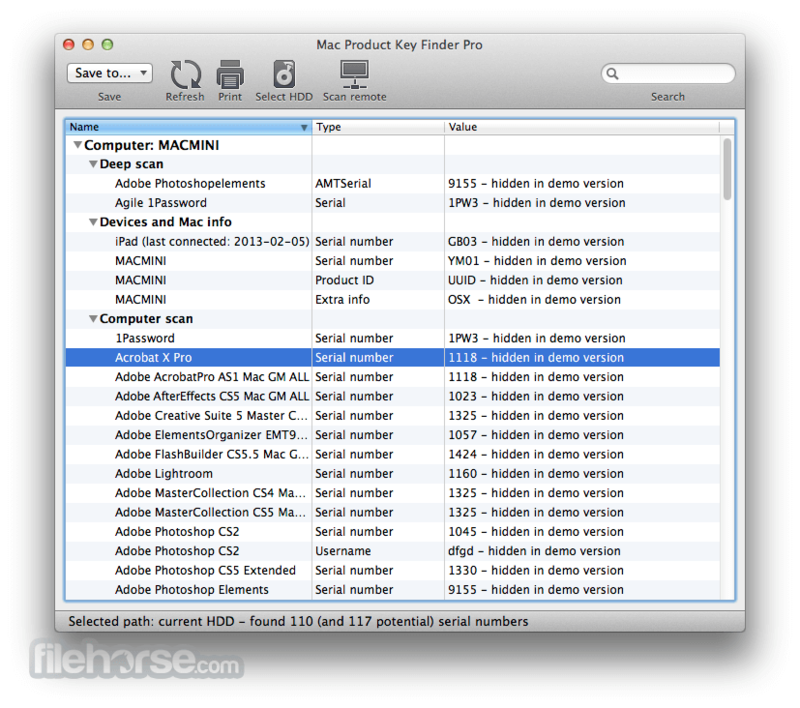 At the moment, there are 2 versions of Mac Product Key Finder: Freeware and Professional versions. Pro version supports more software and has more useful features, such as "Deep scan" and network Mac scan. Below, you can see comparison table of features between freeware and Pro versions. Microsoft Office 2011 is NOT supported by Free or Pro versions, and no, unfortunately we cannot add it, since it's encrypted, even though we know where it's stored. Only Office 2008 and beta version of 2011 are supported. Apperture, Final Cut, Logic Studio and Roxio Toast Titanium are NOT supported by Free or Pro versions as well. These keys are also encrypted. Both Free and Pro versions will not work on apps you purchased through Mac AppStore, since they simply come without serial numbers. After you purchase app through AppStore, full version will be downloaded to your computer. Freeware version of course has no limitations, and Professional version will show you only first 4 characters of each product key found, unless unlocked. Freeware version will work on Mac OS X 10.5 Leopard or later, Intel or PowerPC, and Professional version can even run on Mac OS X 10.4 Tiger or later, Intel or PowerPC.